This also marks India’s inclusion in those select few countries that are capable of generating over 10 GW of solar power. Also, with this development, it is expected that India will earn the title of the world’s third largest solar market 2017 onwards, close on the heels of China and the United States. After an enormous amount of $ 679 million / INR 4,550 crores being invested over a commendable time span of just eight months, the Kamuthi Solar Power Project came to life. Adani Green Energy, which is a part of the Adani Group, one the leading business houses in India, has funded this project. The sprawling solar power plant covers approximately 10 square kilometers (around four square miles), and contains 2.5 million individual solar panels/modules, all of which the solar plant has the capacity to charge. Also, a robotic system cleans the plant on a daily basis. 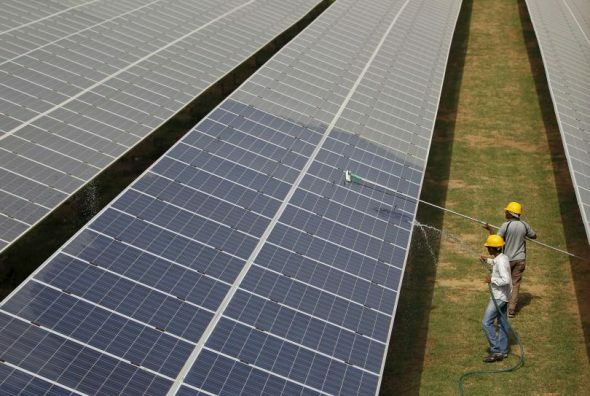 The Kamuthi Solar Power Plant is a part of the Indian Government’s objective of targeting to generate 40% of power from non-fossil fuels over the next 14 years. It is also in support of another one of India’s green aims – i.e. to lower air pollution levels to a considerable extent. However, this is only one step with regard to India inching towards the ambitious goal of leveraging solar power to supply electricity to 60 million homes by 2022. Despite the fact that these efforts are being highly praised and appreciated by various environmental groups, it is also true that the country needs to seriously look at growing the emphasis on solar panels even further. Only then can India expect to bring to fruition the mammoth goals that have been set by the Government.